You wanted more access to theater and we listened. 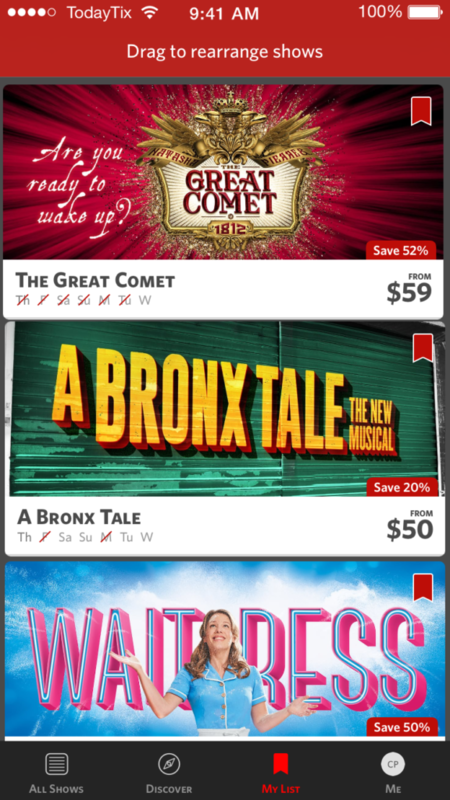 As part of our TodayTix 2.0 redesign, we’re excited to introduce My List. With My List, you can now keep a list of shows you’re interested in seeing. Simply add shows by tapping the flag in the upper right-hand corner. Now you can track availability, pricing, and new show developments all in one easy to access place. Pro tip: rearrange the items in My List by holding down on the show until it highlights, then moving it to the new location. Download TodayTix 2.0 in the App Store or Google Play and let us know what you think on Facebook or Twitter.